Ford has developed a fully automated version of the traditional blacksmithing technique of hot-forming, using robots, giant furnaces and lasers hotter than lava to build safer cars. Hot-forming was first used to craft suits of plate armor, and has now found a second life in Ford's vehicle assembly plant in Saarlouis, Germany where it's been fully automated to create the safety cell for the new Ford Focus. The cell's components are made from boron steel (the strongest steel used in the automotive industry), which is heated to almost 1,000C in a 40-meter long furnace. Specially built heat-resistant robots transport the pieces to a 1,150-tonne press, where they are shaped and cooled in less than three seconds. The heat-formed metal is three times stronger than conventional steels. 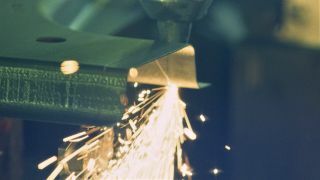 It's resistant to standard drills and blades, and is cut at the plant using lasers operating at 300C. Ford isn't the first car manufacturer to use boron steel (the material is common enough that emergency first responders now carry hydraulic cutters designed to cut it safely so they can rescue trapped casualties after road accidents), but the company's fully automated plant is the first of its kind. "We are building on techniques used to strengthen steel for thousands of years, incorporating modern materials and automation to speed and refine the hot-forming process," says Dale Wishnousky, vice president of manufacturing at Ford of Europe. "The resulting boron steel safety cell helps to make the all-new Focus one of our safest vehicles ever."